Please visit the new CollegeTrad.com: ...must start again. Following my last blog post, where my beloved Hamilton did a humpty dumpty, I fulfilled my loan and returned my father's Bucherer back (he missed it) and picked up a new favorite watch to keep my wrist company until my Hamilton can be put back together again. 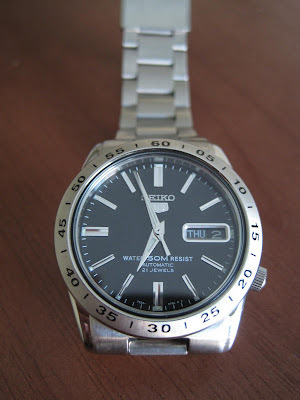 I've been meaning to post this since I received my Seiko 5 SNKE01 a month ago, appropriately nicknamed the "Poor Man's Grand Seiko" for it's similar styling to the far more expensive Grand Seiko GMT. I love Seiko and it is very reputable in the horology community, and the Seiko 5 series provides some of the best entry level automatics with models as low as the $50 range on Amazon. The SNKE01 is rarer but can be had for around $100 new. 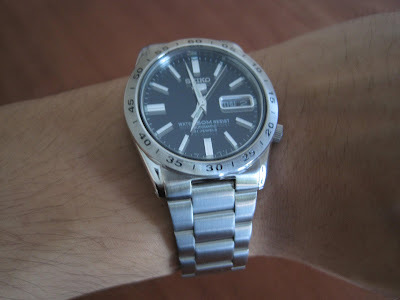 I like the numeral bezel, reminiscent of the Rolex Explorer II (one day...) and the oyster linked bracelet. Very nice styling for barely over a c-note. I want one, but rare is right... can't seem to find one anywhere online.